I was at my favorite Korean grocery the other day when I spotted a tray of something that looked like tiny apples, with mottled red and white skin. 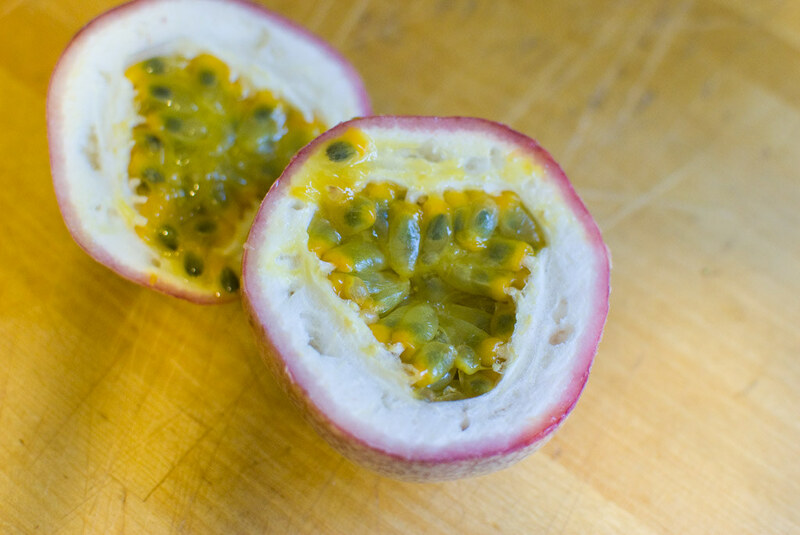 They were, of course, fresh passion fruit, something I’ve never seen before. I do enjoy passion fruit juice so I picked one up to take home. Using a serrated knife I cut through the tough outer skin to reveal the bright yellow seed pods, which when scooped out left behind anemone-like stubs on the inner part of the husk. The seed pods are the edible part; slightly sweet and brightly tart, with a slightly slimy texture, the fruit was very good. Unlike some of the other exotic fruit I’ve tried, the passion fruit I picked up was grown here in the U.S. — I didn’t know that we grew anything like this here.